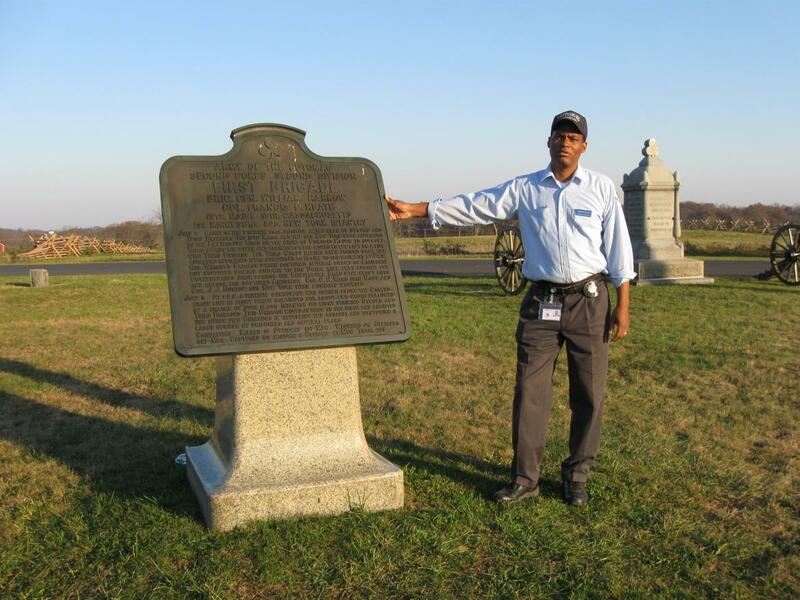 Gettysburg Licensed Battlefield Guide Anthony Kellon is an attorney in the Cuyahoga County, Ohio Public Defender’s Office. Tony has been a Licensed Battlefield Guide since 2006. He continues his series on United States Major General John Gibbon. 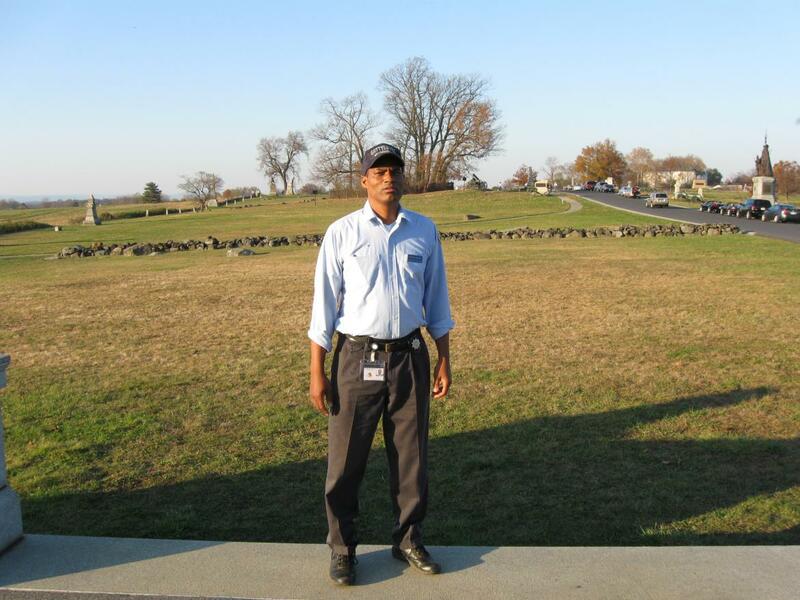 Tony is standing near the statue to Brigadier General Alexander Webb on Cemetery Ridge. The red barn in the right background is part of the Peter Frey Farm. This view was taken facing east at approximately 3:45 PM on Sunday, November 8, 2009. John Gibbon was born in the Holmesburg section of Philadelphia, Pennsylvania, the fourth of ten children born to Dr. John Heysham Gibbon and Catharine Lardner Gibbon. When Gibbon was 11 years old the family moved near Charlotte, North Carolina, because Dr. Gibbon took a position as chief assayer at the U.S. Mint. John Gibbon graduated from the United States Military Academy in 1847 and was commissioned a brevet second lieutenant in the 3rd U.S. Artillery. He served in the Mexican-American War without seeing combat, attempted to keep the peace between Seminoles and settlers in south Florida. In 1855, Gibbon married Francis “Fannie” North Moale. They had four children: Frances Moale Gibbon, Catharine “Katy” Lardner Gibbon, John Gibbon, Jr. (who died as a toddler) and John S. Gibbon. Lieutenant John Gibbon taught artillery tactics at West Point where he wrote The Artillerist’s Manual in 1859. The manual was used by both sides in the Civil War. In our first Gibbon post, Gettysburg Licensed Battlefield Guide Anthony Kellon showed us where Gibbon directed the Second Army Corps through Taneytown Maryland, and where they bivouacked near Gettysburg on the night of July 1, 1863. In our second post, Licensed Battlefield Guide Tony Kellon described the three positions occupied by the Second Army Corps on July 2, 1863. In our third post, Gettysburg Licensed Battlefield Guide Tony Kellon provided biographical information on General Gibbon including how he rose in rank at the beginning of the war. In our fourth post, Tony Kellon describes the brigade and divisions commanded by Gibbon before Gettysburg. He also discusses Gibbon’s relatives from North Carolina. In our fifth Gibbon post, Gettysburg Licensed Battlefield Guide Tony Kellon discusses Gibbon relationship with Henry Hunt and shows us the terrain defended by Gibbon’s Division on July 2nd and 3rd, 1863. In today’s Gibbon post, Tony Kellon shows us the positions of Webb’s Brigade, Hall’s Brigade, and Harrow’s Brigade from Gibbon’s Division. 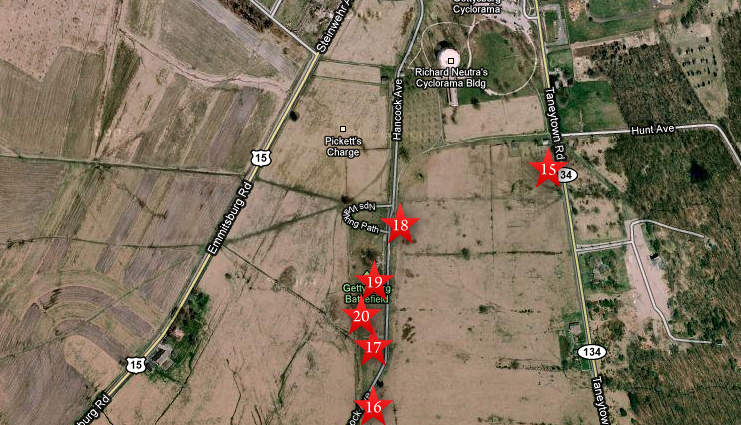 This map shows the location of the videos taken during our series on John Gibbon. Videos #1-14 were shown in our previous Gibbon posts. Video #15 was taken at the headquarters marker for Brigadier Henry Hunt on the Taneytown Road. Video #16 was taken at the marker for the Second Division of the Second Corps (Gibbon’s Division) on Cemetery Ridge’s Hancock Avenue. Video #17 was taken at the U.S. Regulars Monument on Cemetery Ridge. Video #18 was taken at the monument to Brigadier General Alexander Webb on Cemetery Ridge. Video #19 was taken at the position of the brigade commanded by Colonel Norman J. Hall. Video #20 was taken at the position of the brigade commanded by Brigadier General William Harrow. This map was created facing north at approximately 7:30 PM on Friday, November 27, 2009. 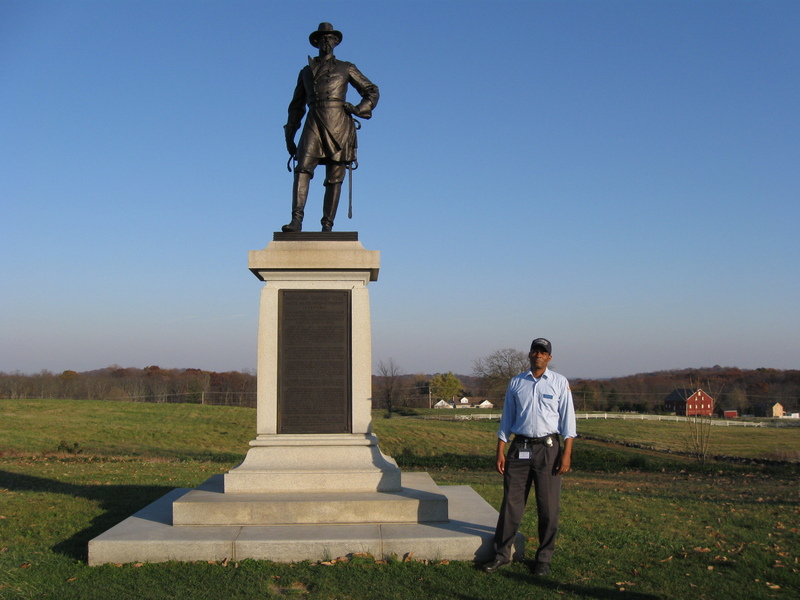 In Video #18 (Videos #1-17 were shown in our previous Gibbon posts) Gettysburg Licensed Battlefield Guide Anthony Kellon is standing near the statue of Brigadier General Alexander Webb on Hancock Avenue. He shows us the position occupied by Webb’s Brigade. This view was taken facing east to southwest to east at approximately 3:45 PM on Sunday, November 8, 2009. We have now moved to the position occupied by the Third Brigade of the Second Division of the Second Corps commanded by Colonel Norman J. Hall. The Copse/Clump of Trees is directly behind Tony. This view was taken facing north at approximately 3:45 PM on Sunday, November 8, 2009. In Video #19 Licensed Battlefield Guide Anthony Kellon is standing in the position occupied by Hall’s Brigade of Gibbon’s Division. He points out the position of the regiments in this brigade on July 2, 1863. This view was taken facing north to northwest to northeast to northwest to northeast at approximately 3:45 PM on Sunday, November 8, 2009. Licensed Battlefield Guide Tony Kellon is standing by the marker for Hall’s Brigade on the east side of Hancock Avenue. The red barn in the right background marks the Peter Frey Farm. This view was taken facing east at approximately 3:45 PM on Sunday, November 8, 2009. 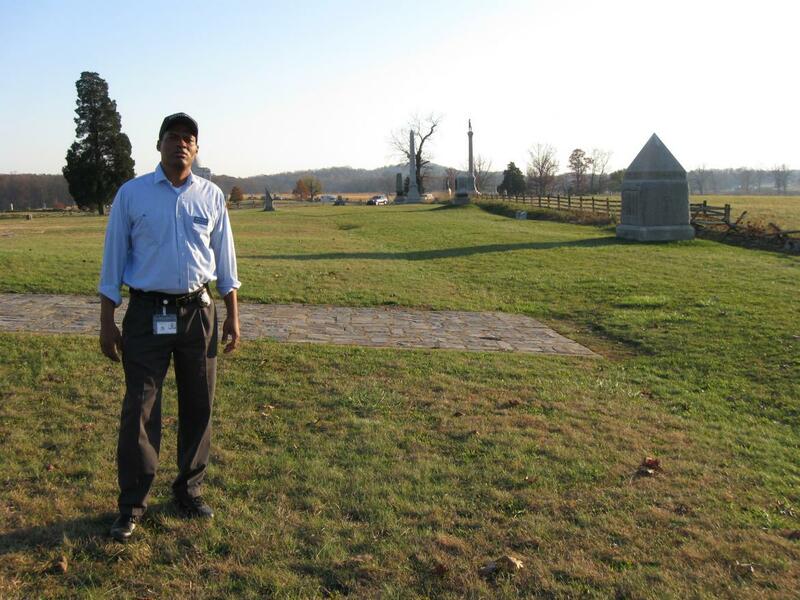 Anthony Kellon is standing on Cemetery Ridge, at the position occupied by Harrow’s Brigade of Gibbon’s Division. The large monument on the right is to the 19th Maine Infantry Regiment. The tallest monument in the background is the Vermont State Monument. Big Round Top and Little Round Top are behind (south of) the Vermont monument. This view was taken facing south at approximately 3:45 PM on Sunday, November 8, 2009. 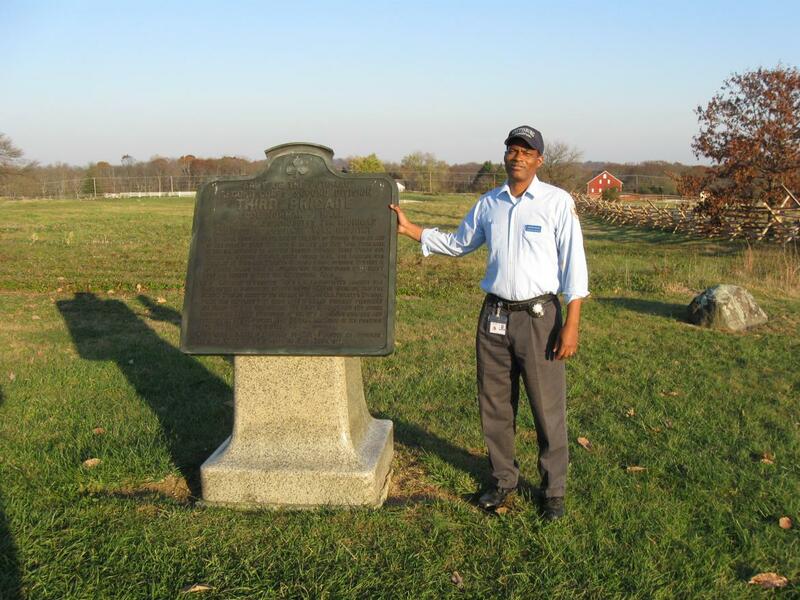 In Video #20 Tony Kellon is standing in the position for Harrow’s Brigade on July 3, 1863. He points out that on July 2, 1863, were in reserve until they were deployed to various parts of the battlefield to plug in gaps in the Union position. Tony mistakenly said that the 59th New York was part of Harrow’s Brigade, and of course he meant the 82nd New York. This view was taken facing south to southeast to south to southwest at approximately 3:45 PM on Sunday, November 8, 2009. Tony Kellon is standing by the marker to Harrow’s Brigade on the west side of Hancock Avenue. This view was taken facing southeast at approximately 3:45 PM on Sunday, November 8, 2009.